I was raised in a Southern Baptist household. My family was rather typical in most respects but I was introduced to the Gospel at 6 years old being told that Jesus died for me because I was born a sinner and that one day if I did not accept him I would go to Hell and not be with my loved ones in the afterlife. This filled me with some dread as I surely didn't want to go to Hell and I also didn't want to be separated from my loved ones in the afterlife. Oddly my family weren't big church goers but I was constantly reminded that I was nothing without Jesus. This also effected my personal outlook on life. I found myself at 11 years old being scared by a sermon on Hell that I walked down the aisle and said the Sinner's Prayer and asked Jesus to come into my heart and later got baptized. I read my Bible regularly but lived a rather normal life thinking I was safe. But then at 17 years old I was conflicted whether or not I was truly saved and rededicated my life to Jesus. I was baptized this time in a Charismatic Church. This was all due to the influence of one of my Martial Art teachers who was also the pastor of this Charismatic Church and who convinced me that I had to be born again. One of the ways that the pastor convinced me of this was giving me the book “More Than A Carpenter” written by Josh McDowell and later “Evidences That Demand A Verdict”. I was so influenced by the books that I decided that I would dedicate my life to becoming an Apologist and doing ministry. I was involved in Street Preaching, Youth Ministry, and Homeless Ministry and devoted every spare minute I had to becoming as educated as I could in the field of theology and apologetics. I eventually moved away from the Charismatic beliefs and returned to my Southern Baptist roots and ended up enrolling in Liberty University(LU) Correspondence Courses in theology and apologetics. Everything seemed to make sense until I encountered the Problem of Evil(PoE). After much thinking and researching I found that the Free Will Defense that I previously held regarding the PoE had some major problems. How could I square the reality of suffering/evil in the world with an omnibenevolent, omnipotent god? It took me several years to think things over but eventually I came to see that the omni-characteristics of the Christian god didn't square up with the PoE. I was deeply affected by this information and although I continued ministry I so desired to answer this problem that I even began to read non-christian sources. I eventually began to see that the PoE was an insurmountable problem and that it had not been sufficiently addressed by Christian apologists and philosophers. I began to doubt whether I had sufficient reasons to believe in the Gospels. I also wrestled with what has popularly been called the Problem of Divine Hiddenness. I soon discovered the writings of Robert G. Ingersoll, George H. Smith, Thomas Paine, Jean Meslier, and Bertrand Russell . I tried to wrestle against their reason but eventually had come to see that they were in fact correct regarding their summations about Christianity. During this time I tried to speak with other ministers and even wrote my Professors at LU. All I got were stock answers and not one of them convinced me that they were anywhere near correct or logically sound. I really tried to hold on to Christianity and didn't want to depart from doing the good things I did in the ministry such as taking care of the homeless and visiting the sick and elderly. But I also could no longer live a lie. I no longer believed in the supernatural claims of Christianity and after much heartbreak and rejection from almost all my friends, and some family members, I left the ministry and told my church that I was no longer a believer. I joined the Army (6 years) and took college courses and spent much of my time reading and discovering who I truly was as a person. I tried to hold to a weak version of Deism until I read Michael Martin's book “Atheism: A Philosophical Justification” in 1991. It was then I admitted that I was an atheist. I remained rather quiet about my unbelief until after 9/11. I was then introduced to the work of Sam Harris, Richard Dawkins, Daniel Dennett, and Christopher Hitchens. However due to work I was not afforded a lot of time to pursue my interests. This changed when in 2010 I became 100% physically disabled by a rare neurological disease that left me bedridden and I spent that time reading and watching videos and documentaries. Eventually in 2011 I found The Atheist Experience on YouTube and continued to build up my knowledge and methodology in 2013 and onward. I decided to openly discuss atheism and also my love for Science, Humanism, Critical Thinking, and Skepticism on my personal Facebook largely to the discussions I had with Dr David Madison and John W. Loftus. I was meet with great displeasure by some friends and family members but I decided this was who I was and I was going to continue despite their displeasure. 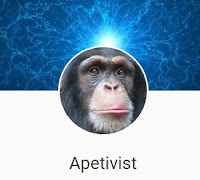 In 2017 I decided to start a Twitter account @apetivist and got a quick following. I dedicate a few hours daily to maintaining my Twitter account and keeping up with the latest theistic arguments. Feel free to follow me on Twitter and if you have any questions feel free to ask. I follow you on Twitter, but it's great to read the whole story here. Oh man! Sounds like quite then ride so far! Do you still have that same feeling of “being loved”? Or has it gone away now that you know there’s no “being” to love you. Sounds like you have an amazing wife! Sorry I rarely blog anymore but I will tell you that when I was a Christian I thought that god loved me and I felt deep emotions during prayer, worship, and listening to sermons but that in and of itself was not proof that a deity loved me nor are the claims in the Bible that it loves me. The only love that has ever mattered to me comes from my wife, family, and friends. I don't need a deity to confirm that my life has meaning. Admittedly I have chosen that meaning myself but I think it is far better than thinking that someone else already carved out that meaning for me. Yes, my wife is so sweet and caring. I really feel that I got lucky finding her. I hope you also have or will have somebody that loves you just as much. Take care!